My new year’s resolution is to eat and drink at as many places as possible that I've never been. I like running starts, so I put my resolution into effect at the beginning of this week. Unfortunately, looming work deadlines are cramping my style these days, and I’ve had to limit my new food adventures to places where I can eat and be industrious. I am on a winning streak. Monday was Bridgeport Coffee House. 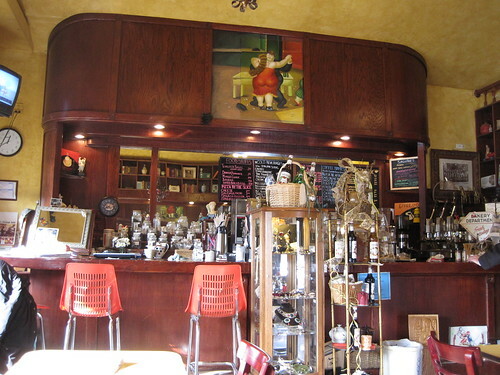 Yesterday was Star Coffee Lounge in Humboldt Park. Today was the clincher. Thanks to a tip from Mike G, I ventured north and west to Norwood Park to visit to the mentioned-only-once-by-Pie-Lady Kouks Vintage Café and Resale Shop. I felt like Sharon in Wonderland here. On an otherwise industrial stretch of Northwest Highway, Kouks is basically an expansive, split-level house teeming with fantastic possibilities for "Guess the Café" clues: from the Mr. Rogers-like mannequin seated with crossed legs and suitcase on a bench out front; to the Botero reproduction of a dancing couple above the bar; to the giant ceramic Miss-Piggy-with-jester-hat piggy bank that presides over the seating area. And these clues are only from the front, café area of Kouks. Further clues abound on the second, rear level where the resale shop is concentrated and outside on the large and for now snow-covered patio. According to Georgia, one of the owners, Kouks opened eight years ago. An Italian restaurant previously occupied the space and, "way back," it was a mom-and-pop shop selling eggs and bread in the front portion of the building with said mom and pop residing in the back. 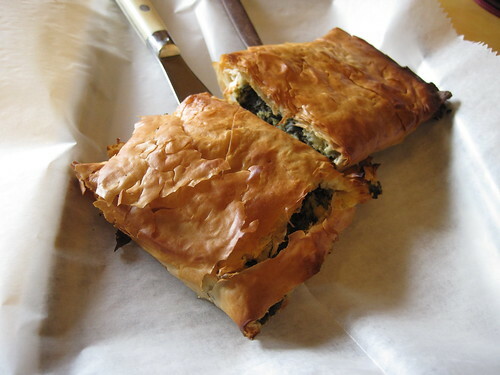 Kouks Café serves: pizza by the slice (cheese and sausage/peperoni, $3), spanakopita ($3.75), pastries (danish, $1.75; mungo cookie, $1) and other snacks (banana, $.75; hard-boiled egg, $.50). Georgia also mentioned an egg sandwich. Cold drinks include: Italian sodas, Jarritos, Coke and smoothies. Kouks brews Java Joe coffee with one chalkboard extolling the Meaning of Life blend as award-winning and the best in Chicago ($1.50, 12 oz. ; $1.75, 16 oz.). 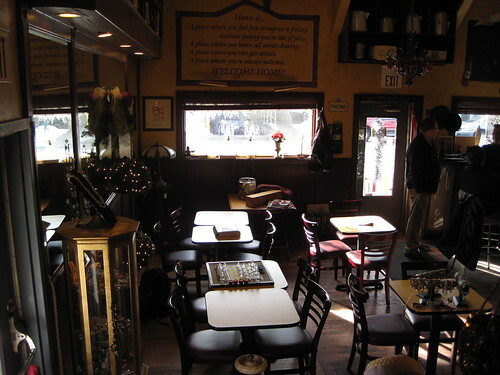 The café also offers “Coffee Yummies,” specialty drinks that include the Black Tie Affair and house creations the Double Nut Case and Chitown Brownie (prices not listed on the menu). To my delight, Kouks is also serious about tea with at least ten loose black, green and herbal varieties, steeped with timer precision (16 oz., under $2; pot, up to $6.25; leaves by the ounce to take home, $2.50 and up). I also had an Earl Grey tea which, fortunately that I might be able to sleep tonight, was not as strong as it looked and smelled. The blood orange tea I enjoyed even more. It had a less tart flavor profile than most citrus-flavored teas I've tasted. Also, it seemed to have a hint of woodiness, like a rooibos. Kouks, like any coffee shop, has its regulars, who were--without exception--as warm and friendly to this newcomer as Owners Georgia and Andy. With the aid of free and fast wi-fi, I put in a few very productive hours of work and then explored the Wunderhaus that is the retail shop. I enjoyed the array of ceramics. Looking at what I chose to photograph today, I must have had drink on the brain. 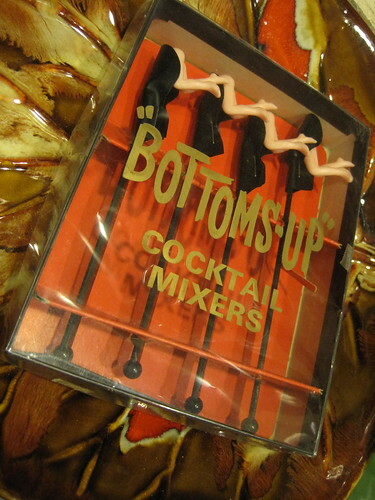 My purchases, in fact, included a pair of snifters and a pair of beer steins, for which I paid a total of something like $3.00, with all glassware at Kouks currently 30% off. I regret passing up a copy of The Mystery Chef's Own Cookbook in good condition and books on other topics, all very reasonably priced. A few more photos I took at Kouks can be found in this Flickr set, but there is much more to peruse at this unique Northwest Side one-two punch than my images suggest. 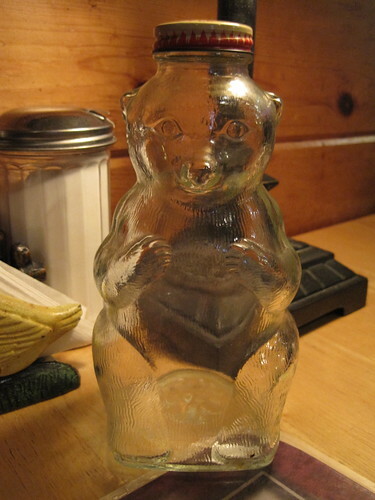 I left Kouks to meet Mama happy_stomach for an early dinner nearby, where I gifted her with one of my finds--a Snow Crest syrup container-bear bank. Guess the restaurant. *The only Stevie's I can guess is Stevie's Latin Village, the Decatur location of which is discussed in this thread. 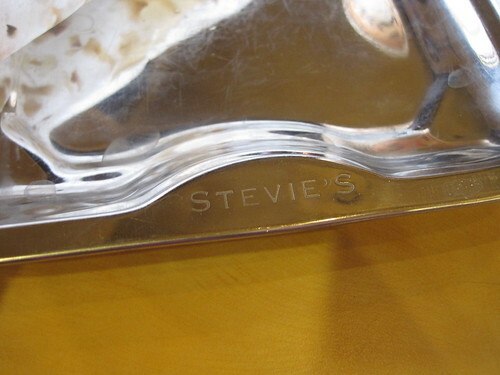 However, a Stevie's server once told 66 News!, "All the dishes, menus, ashtrays, etc. had [Stevie’s] caricature on them." The silver tray at Kouks today had no caricature. Kouks is in my neighborhood, and we visit often. My kids love the place. We can go in there and have a cup of coffee (me) and sodas (for the kids), play a game of checkers, chat with the lovely Georgia and shop for some unique and fun knick-knacks. The place is also dog-friendly and we will walk our dog here in the spring/summer and sit on the patio. 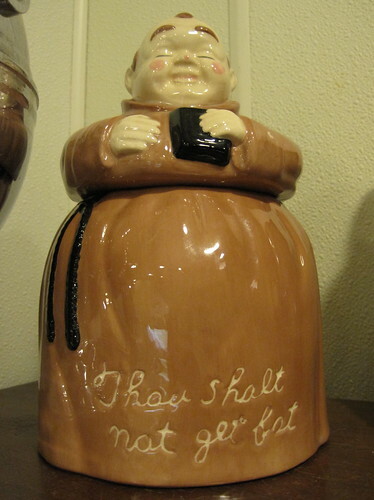 Oh as for guess the restaurant? 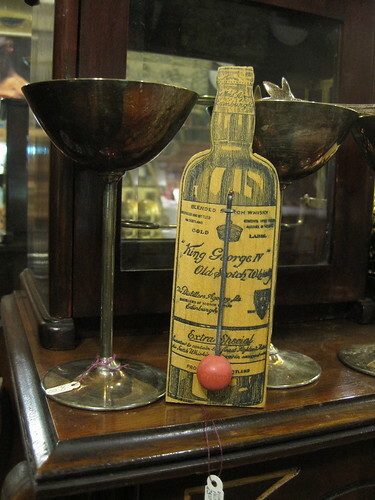 I recognize the napkin holder and lamp: Smak-Tac. CM2772 wrote: Kouks is in my neighborhood, and we visit often. My kids love the place. 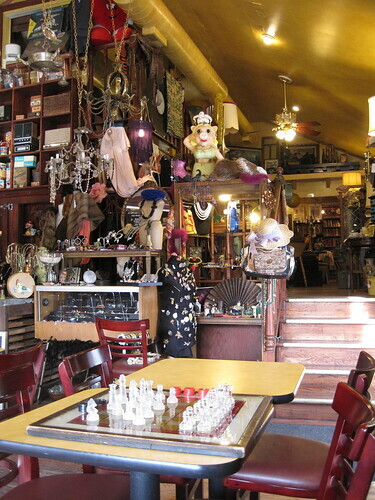 We can go in there and have a cup of coffee (me) and sodas (for the kids), play a game of checkers, chat with the lovely Georgia and shop for some unique and fun knick-knacks. Kouks, indeed, seemed very kid-friendly. While I was there, an adult came in with a child, maybe nine- or ten-years-old. They took seats at the bar, and the child asked Georgia how much he had left in his "money account," a kind of shop credit from what I could tell. Georgia checked a slip of paper taped to the side of the hulking, old-fashioned cash register and told the boy, "$3.00," which was enough to get him a slice of pizza, with his adult companion chipping in for a soda. Later in the afternoon, a group of teenagers came in looking for attire to wear to a Mad Men party. I'm not a parent, but if one were to lend me a child for a day, I'd much prefer to take him or her to Kouks over, say, a place like Uncle Fun. 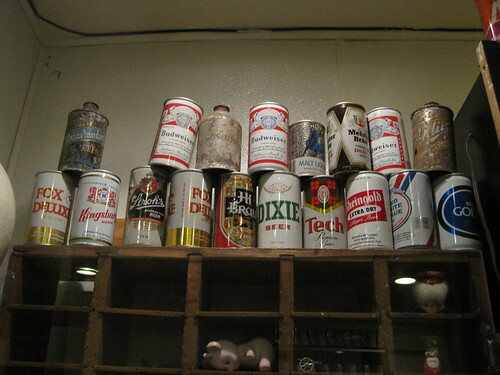 The former doesn't offer the zany kitsch of the latter, but Kouks has food, drink and inventory that inspires more curiosity, besides its own modest toy section with action figures and PEZ dispensers. CM2772 wrote: Oh as for guess the restaurant? I recognize the napkin holder and lamp: Smak-Tac. 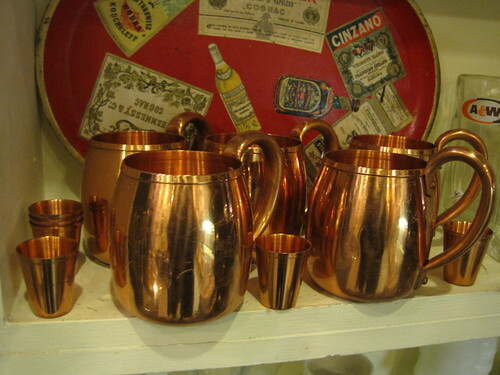 Those are Moscow Mule mugs! See the Mad Men Cocktail Guide. ah... this is why I love LTH. I've passed this place several times, but never considered stopping. Now I will. Shoot. And they were in really good condition, too. 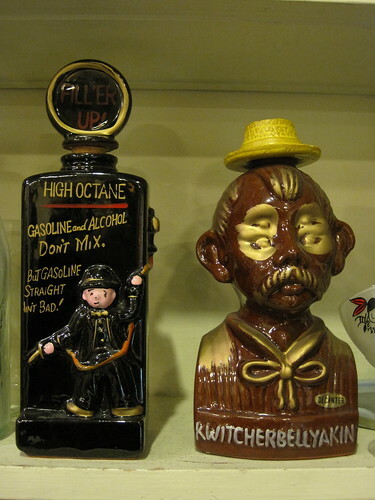 I don't think I checked the price, but if no one's bought them yet, they can be found on the same shelf, directly underneath the ceramic decanters pictured above. I just thought they looked cool. Has anyone been here recently? I can't find a website, but I think they are still in business based on the date of a review on ahem another site. My pro bono client is coming up tomorrow for a meeting (she's in Joliet and I'm in Park Ridge). I had suggested lunch, but she prefers coffee because she is on a strict diet. While I suppose atmosphere isn't necessarily important, I sure would love to find a spot that isn't you-know-what! We also need a place where it is OK to hang for a while while we discuss things, say at least an hour or so. If anyone has ideas for other places we could go, too, I'm all ears! While not GNR material, the crepe place just south of the Pickwick on NW Hwy is a comfortable place to sit for an extended time, never so crowded that I feel uncomfortable doing so. Light meals available and fancy coffee drinks. Very nice people too. lighthouse wrote: While not GNR material, the crepe place just south of the Pickwick on NW Hwy is a comfortable place to sit for an extended time, never so crowded that I feel uncomfortable doing so. Light meals available and fancy coffee drinks. Very nice people too. Thanks, lighthouse! I will have to try the crepe place -- I think they were at the recent Taste of Park Ridge, but I never made my way Uptown to sample the food. She was very pleasant, and made suggestions until I hit that moment of "yes, I think that will do the trick." So I had iced tea that was freshly brewed for me. She also poured me a sample of another tea to try in addition to the one I ordered. Very nice experience, in addition to being a good meeting; I talked to "Kouk" before I left to tell her what a great spot it was, and where I found out about it.